Hello everyone, I am looking for lacquer options for the bore of my Shakuhachi. I want to use something that I can obtain in the USA and has similar properties and color/consistency as Urushi. I have been looking at resins and searching for a possible alcohol soluble solution there perhaps. I would prefer to find something I could buy and use and it would work well. I also need some application tips for the bore as well. Have you ever looked at using Kashu? From what I know in the Japanese sword world many Sayashi (Scabbard maker) haves started using Kashu for cost and also to preven tany allergies when making their scabard or when thier customer are handleing them. From what I was told kashu has about the same finish as Urushi but is not as toxic. Some purist who do very high end lecquer work will spit on it but many scabbard maker who make swords for the martial arts world will use thi sinstead now. I feel that using this on the bore of Shakuhahci would be good. Any of the makers here ever used this stuff? Here is the only link I have found so far that sells Kashu tough I am sure there is also some other sellers out there. Hello everyone, I am looking for lacquer options for the bore of my Shakuhachi. Lots of options here. They all have their own pros and cons. I'm an urushi guy but I understand that some makers are having some success with shellac. Might be something to look into. 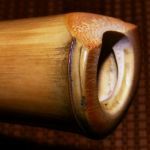 Also, I believe Monty Levenson uses a non-urushi lacquer mixture for his flutes. In addition to the above, you might also check out a new water-based lacquer called KTM-9. http://www.graftedcoatings.com/wood_cle … asp?iid=25 - a lot of other detailed info on web, as well. As my urushi sensitivity keeps increasing, I have been experimenting with many different alternatives. For bore work, KTM-9 is my most preferred (next to urushi), as it is, essentially, odorless, dries rock hard without being brittle (a possible issue with shellac), and sands beautifully. Once you get to know it's application personality (i.e. time between coats, full-cure time, etc. ), it can be a very good alternative, and/or great for simply experimenting within the bore. Cashew is a superb alternative for any exterior aplications, but too noxious for bore work, IMHO. It is a synthetic with some nasty agents in it's composition. Many makers have used this in the bore, sometimes by makers who are allergic to urushi. I've had a few flutes with cashew and it seemed to do the job. However I have heard that after a certain period of time it starts to get unstable (10-20 years) and then flakes and starts coming out of the bore. It also has a weird smell but then so does urushi. I've been experimenting with "Nelson Hobby Specialties Water Reducible Polyurethane Paint" and it seems promising. Dries to a semi gloss in ten or twenty minutes. Little or no odor. Cleans easily with water. They claim it is unusually durable but I haven't been able to time test accurately. Looks like they are trying to sell the company so orders may be on hold for the time being. "This paint cleans up and is thinned with normal drinking water. The same organic resins used in solvent-based paints are modified to make them dispersible in water. A small amount of water-soluble co solvent is present to aid in film formation and to speed drying, but a pint of this paint contains 75% less solvent than a pint of solvent based paint. Coverage ability is excellent, more so than most paints. The paint can be used right out of the bottle, however up 15% or more water should be used to allow for spraying and better brushing applications."